Today the parties in the Joel Tenenbaum case jointly submitted a proposed juror questionnaire for use during voir dire. The questions are routine, and closely resemble those asked orally by the attorneys at the recent Jammie Thomas-Rasset trial in Minnesota. What I'll be watching for is what Tenenbaum's defense team actually does with the information submitted by the potential jurors. 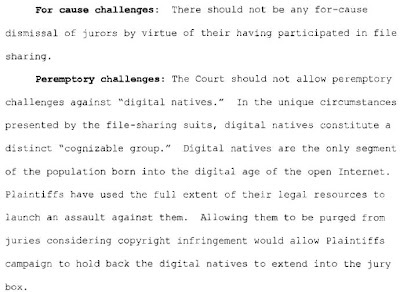 A pretrial memorandum submitted by Tenenbaum back in November 2008 contained this intriguing passage, asserting that the record label plaintiffs should not be permitted to use peremptory challenges against "digital natives," in what would be a rather novel application of Batson principles. Tenenbaum's most recent pretrial memo does not include such an argument.